A few weeks ago I asked for permission to photograph this beautiful old building near the Brisbane River at Graceville. It is currently an aged care facility, so I was conscious of the need for the security of the residents. The facility's manager gave me permission to take some photographs on the premises for which I am extremely grateful. This heritage listed building is known as Beth-Eden, and it has several links to Brisbane history. 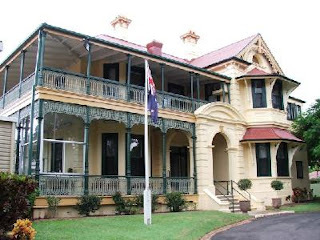 It was built in the late 1880s to a design by famous Brisbane architect Richard Gailey. 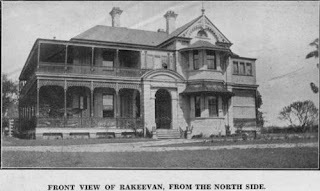 Known then as Verney, the house was the residence of Charles Buzzacott, politician and proprietor of the Brisbane newspaper the Courier. Originally from England, Buzzacott trained as a compositor in Sydney before becoming a newspaper journalist and founder of the Maryborough Chronicle. After selling that newspaper, he became an MLA in the Queensland parliament, representing Rockhampton where he had newspaper interests with his brother. He resigned from parliament in 1877 to become a journalist for the Courier, buying an interest in that paper in 1880. In 1883 he became a partner and managing director of Brisbane Newspapers Pty Ltd, a position he held until his retirement from the newspaper business in 1894. Buzzacott returned to politics, this time as a member of the Legislative Council, although he was destined to have another dip into journalism when he formed the Daily Mail in 1903. In 1895, Verney was sold to John Ferguson MLA as a residence for his daughter and her husband, Mr & Mrs AH Chambers. 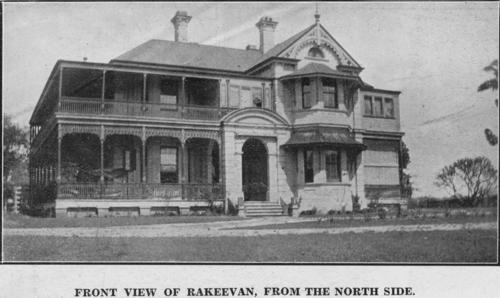 They changed the name of the home to Rakeevan after Mr Chambers' home in Ireland. Rakeevan was used as a military hospital during and after WWI. Here is a photograph of it from 1931. The house was sold to the Glad Tidings Tabernacle in 1957, and was opened as a retirement home in 1958 under the name Beth-Eden. Here is a photograph of it from 2009. As well as the house, a stables building has been preserved on the site. 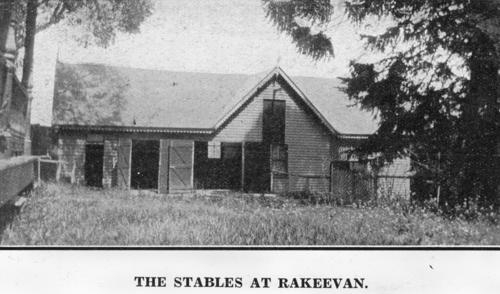 This is a picture of the stables from 1931. The stables are now used as a garage and storage facility, but the original gabled roofline can still be seen. Beth-Eden is now run by Bethany Christian Care and comprises independent living units as well as aged care facilities. I don't think I have seen any contemporary domestic architecture quite like this before, yet the photograph of Beth Eden from 1931 shows that it hasn't been messed around with since then. The archway over the steps, leading to the veranda and front door, seems monumental (literally). The gable facing the front street has a very interesting semi circular decorative element inside it. And the eaves over the bay window, top floor and ground floor, feel something like a Chinese pagoda. I love it. The house is quite striking, and it has been well kept inside and out. It was a pleasure to visit.